An unspecified service outage that has been ongoing for nearly 36 hours is impacting a small percentage of Apple customers attempting to use iCloud Backup, prohibiting them from creating new backups or restore from previous saves. 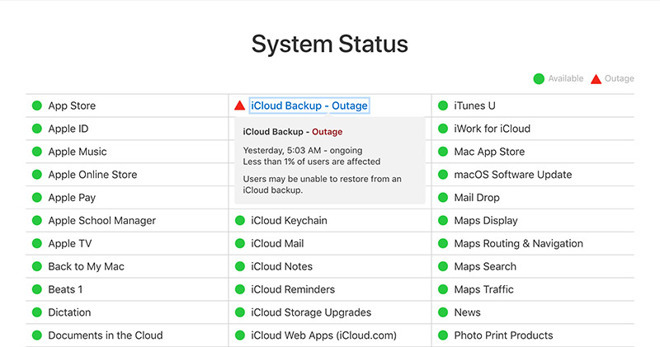 According to Apple's system status webpage, the company's iCloud Backup service has been down since 8 a.m. Pacific on Tuesday. The downtime is ongoing at the time of this writing. As its name suggests, iCloud Backup allows users to backup device settings, app data and other critical assets to the cloud for later retrieval. Like local backups to iTunes, device backups to the cloud provide peace of mind in the case of a drastic system failure. More frequently, however, iCloud Backup is used to provision and move data over to newly purchased devices. For example, a customer purchasing a new iPhone might use iCloud Backup to transfer over saved device preferences, call histories, iMessage strings, App Store purchases and more from their previous device. iCloud Backup also handles Apple Watch backups. Apple notes less than one percent of users are impacted by the outage, but with an install base of millions, that number runs into the hundreds of thousands. The company failed to specify the origin of today's troubles, but it can be assumed that engineers are working to resolve the issue. Apple has not commented on the downtime and does not provide estimates as to when a fix will be in place. Update: Apple resolved the issue at approximately 5 a.m. Pacific on Thursday.